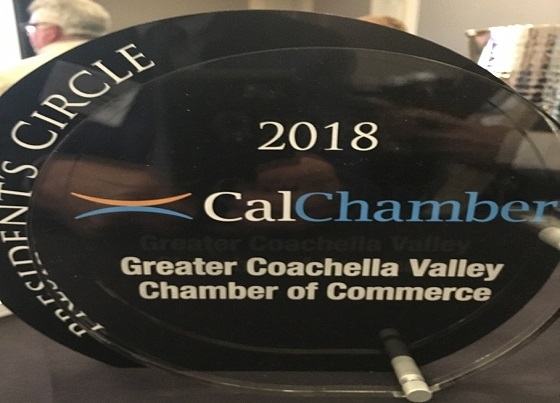 Sacramento, CA: The California Chamber of Commerce has awarded their 2018 President’s Circle Award to the Greater Coachella Valley Chamber of Commerce (GCVCC). The award, first presented in 2009, recognizes chambers for excellence in business advocacy and helping their members comply with California employment laws. Representatives of the President’s Circle chambers were honored May 23 during the CalChamber Capitol Summit in Sacramento. Patrick Swarthout, the Community Development Officer for the GCVCC, and Julio Figueroa (AT&T), the GCVCC Business Legislative Advocacy Committee Chair, were present to receive the award on behalf of the chamber.